The whisky world isn’t all vice over virtue: some dedicated drammers like to get out and earn their whisky by running, climbing or swimming against the clock. After all, if whisky is a drink for celebrations, the finish line is the perfect place for a glass. Matt Evans tells you where best to lace up your trainers and earn your drams. If you thought that a whisky lifestyle consisted of laconically swirling Glencairns in recliner armchairs, you’re missing out on both pleasure and punishment. A devoted sect of whisky lovers make a habit out of swapping tasting notes for Nike trainers, running through picturesque landscapes and past famous distilleries before rewarding themselves with a well-deserved drink. Sign up to one of these races, from swimming through Speyside to racing through the Louisville streets, to get to grips with the terroir surrounding your favourite distilleries in a truly unique way. See you at the finish line for a dram. Could there be a more picturesque way to feel exhausted? Alternating between cycling, trekking and sea kayaking, you’ll be briefly visiting each and every one of the distilleries on Islay and Jura over the course of an action-packed two days. Not much time to do the tours, but you’ll be picking up a miniature from each distillery on the way before heading back. A route that takes place amid some of ‘the most beautiful scenery you’ll ever see’, the Ardbeg Half gives runners the opportunity to experience the island on foot without committing to the full marathon. Runners set off from the village of Bowmore to Islay Airport and back in a circular route, ending the race near Bowmore distillery. It would be criminal not to pick up at least a bottle of each. Sláinte. Sensing an Islay theme here? You’ll be running the length and breadth of this small Scottish isle, taking in coastal views, traversing the single-track ‘High Road’ that runs through Islay’s moors and past historic distillery sites such as Bruichladdich and Port Ellen, before coming to rest at Ramsay Hall. If that doesn’t deserve a tot of whichever Islay whisky is your chosen poison, nothing does. The next best thing to swimming in Scotch whisky is to swim in the river that runs through its heartland. The River Spey 10k gives you the chance to do just that – a new event for 2018 that will see competitors plunging into the river in a wild race to the finish. If you’re feeling particularly masochistic, you’re a seasoned triathlete or you just prefer the open water to road races, this is the event for you. Stay awhile in the Cairngorms to visit one of the many Speyside distilleries, even if it is just to point to a bottle and tell your family that you ‘swam in that’. Run (or walk) along the idyllic Northern Irish coast, experiencing some of the most beautiful scenery that the British Isles has to offer – including world-famous rock formation the Giant’s Causeway. Of course, you might be too tired to notice, especially if you’ve chosen to do the gruelling 40-mile ultra. If you survive that, the closest town is Bushmills, where you can visit a whiskey distillery shaped by the fey landscape you’ve just run through. Named after the races that distillery workers used to hold in the 1840s, moving a barrel from warehouse to warehouse as fast as they could, Whiskeydaddle today comes in plenty of different sizes. The ‘Barrel’ is the full marathon, the ‘Bottle’ is the half, all the way down to the wee ‘Shot’, the 5k. Explore Peoria with one of these races or test your might in the Daddlefest Games, heaving real barrels around the place against the clock. More Crossfit than cross-country? The Whiskeydaddle team has you covered. Got 11 like-minded friends to hand? You’ll need them. The Bourbon Chase is a 200-mile relay race across Kentucky, travelling through seven different distilleries, forest, desert and all manner of historic sites from Bardstown to Lexington. Each runner gets a leg of the race, splitting the mind-boggling distance into manageable chunks. It’s definitely one way to see the sights, although hopefully you won’t be stuck with the night shift. 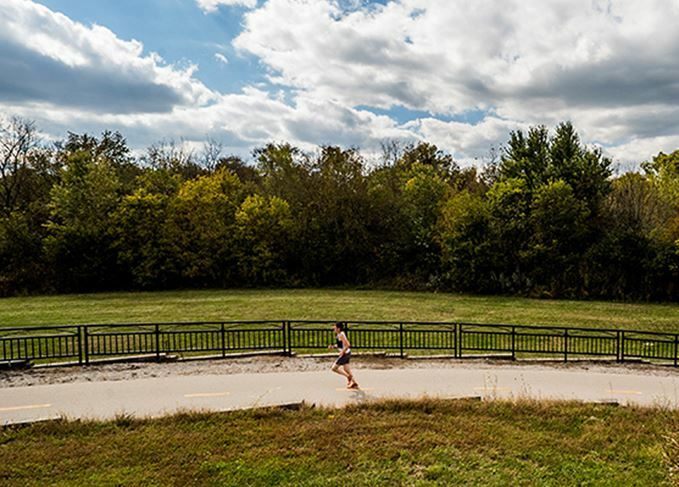 Sponsored by Jim Beam, the Urban Bourbon Half starts along the Louisville waterfront and takes you through the city, past the Evan Williams Bourbon Experience, all the way to Beargrass Creek Greenway and back. Less strenuous than the relay chase, once you’ve finished the hard part, make your way over to the Pendennis Club, a bar widely purported to be the birthplace of the Old Fashioned. Didn’t get into the London Marathon? We can do you one better – visit Speyside in full autumnal bloom, run the course, finish at the Dufftown distilleries (where else?) and pick up a little collection of miniatures from all the distilleries you pass. For those who aren’t prepared to go the whole hog, the course can be tackled in teams of four, or you can elect to take on the half Dramathon or 10k instead. Seven UNESCO World Heritage Sites, temples galore and the marvels of modern Japan sit side-by-side on this course, with Kyoto itself sitting under the shadow of Mt Tennozan. After your shower, head south-west to the foot of the misty mountain to find Yamazaki distillery, a site like Kyoto itself – as in touch with nature and tradition as it is with industry. A perfect Japanese dichotomy.